Graduation cords are the perfect way to acknowledge your graduates for success in specific areas of study, or for unique achievements and excellence. Who's Who Among Students in American Universities and Colleges is a special award for students who have demonstrated particular ability in any number of areas. Whether your student has kept a particularly impressive grade point average, demonstrated excellence in leadership or service, or has achieved some other personal academic or extracurricular goal, the Who's Who list bestows an impressive and great honor. 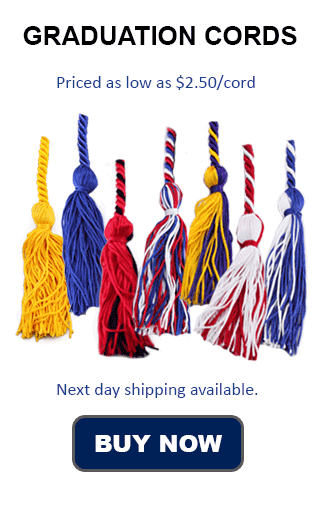 When it is time for graduation, make sure your Who's Who students are wearing the traditional navy and gold double tied cords associated with this honor. The primary, and most important difference between our navy and gold double cords and the Who's Who Among Students Honor Cord is that you don't have to buy a book to get ours. Our navy and gold graduation cords are all synthetic, and, by request, can come already tied together for your convenience. Navy and gold honor cords worn around the neck at graduation can help ensure that your graduates receiving special honors will stand out and be recognized for their success. Against the traditional black robes of graduation, the navy and gold honor cord adds a distinct pop of color, but can also look well with many different robe shades. Be sure to check with your school administration before commencement for specific instructions on how best to wear navy and gold graduation cords. When your students receive the Who's Who award, they are honored by having their names placed on an exclusive list that is then published in a book which is available for purchase through the Who's Who Among Students website. Names on this list are recognized as being the most excellent, capable, and diligent students in the student world, and your graduates deserve a tangible token of their achievement. Offer them our navy and gold honor cords for your graduation ceremony, and ensure that they feel all the pride and encouragement that come with such great success.